5g (approx. 500 Seeds). Mid-season variety (90-100 days). Root crops are large, weight 250-400 g, cylindrical shape. The flesh is white, firm and juicy with a good flavor. For summer use radishes planted in early spring, winter storage - in the first week of July. Used for fresh consumption and winter storage. 4g (approx. 300 Seeds). Mid-season variety. Roots round, dark-red color. The flesh is juicy, with good taste. High yielding variety. 2g (approx. 100 Seeds). Mid-season variety (65-80 days). 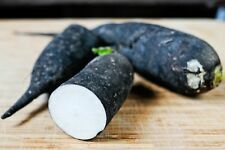 Large, smooth, dark green roots, with a white tip, weight 200-500g (7-17 oz.). Light green, juicy flesh with a slightly tangy taste. Sow in spring for summer harvest, sow in July for winter storage. 1g (approx. 50 Seeds). Chinese heirloom variety. Greenish-white, round, juicy radishes with red flesh. Excellent taste. Can be sow out in spring as well summer in rainy weather. Late summer harvest suitable for winter storage. 4g (approx. 500 Seeds). A mixture of middle-early varieties of radish round, about the same time of ripening. Vegetation period from germination is 25-30 days. The roots have different colors: intense red, yellow, white, pink and dark purple. The mixture can be grown in open ground and under film shelters. 4g (approx. 500 Seeds). Early variety (23-25 days). Roots are rounded, medium-sized; weight 22-25g (0.8 oz. ), red with white base, which occupies a third of the fruit. Flesh is dull white, firm, crispy, with a delicate taste. Variety is suitable for growing in open ground as well as in greenhouses. 5g (approx. 500 Seeds). Mid-season variety. Vegetation period from germination to maturity 60-80 days. Root crops are large, rounded, weight 200-300g, 6-8 cm (2.5-3 in.) diameter, good taste. The flesh is white, firm and juicy. For summer use the radishes are planted in early spring, for winter storage in the first week of July. Used for fresh consumption and long winter storage. 5g (approx. 500 Seeds). Mid-season variety (30-35 days). Round, white, medium size root, weight 25-30g (0.8-1 oz.). Excellent tasting, white, tender and very juicy flesh. Recommended for open ground as well as for greenhouses. 4g (approx. 300 Seeds) - coated. Mid-season (37-45 days) Ukrainian open pollinated variety. Conical, red radish, weight 120-150g (4-5oz). White, very juicy and tender flesh. Good storage qualities. 5g (approx. 500 Seeds). Mid-season variety (35-40 days). Root white color, elongated, cone-shaped, 5-7cm in length, weight 45-60g, without bitterness. The flesh is white, glassy, juicy and crisp, medium spicy taste. The variety is resistant to bolting. Recommended for outdoor cultivation. 3g (approx. 300 Seeds). Mid-season (60-90 days) cold-resistant, Chinese winter radish. Green-white roots with light green flesh. Weight 500-1000g (18-36oz.). Excellent for long term storage. 4g (approx. 200 Seeds). Mid-season (20-30 days) open pollinated variety for open ground and greenhouses. Large, round, intense red radishes, weight 30-40g (1-1.5 oz.). Very delicious, white, firm and juicy flesh. Suitable for cultivation from spring to fall. Also known simply as White Radish, and in Japan as Daikon or Daikon radish, this popular Asian vegetable bears little resemblance to small, round red radishes found in tossed green salads. Also Known as : Daikon Radish, Raphanus Sativus, Japanese Radish, Oriantal Radish, Chinese Radish, Lo Bok, Mooli, Low Bak, Chinese Icicle Radish. See my other lots of seeds. Mid-season variety. Flesh is juicy, white, dense, sweet and excellent flavor. See my other lots of seeds. The flesh is white, slightly sharp taste, juicy and crisp. The variety is valued for its high marketability and attractive roots. Grown in the open ground and film shelters. A very beautiful variety with unique pink flesh. Flesh is very tender and juicy with a slightly spicy taste, very similar to the classic radish. The variety is cold-resistant, good for winter storage, as long holds marketable appearance after cleaning. See my other lots of seeds. The flesh is white, tender, juicy, buttery, with high flavor. The variety is resistant to temperature changes. Used for fresh consumption. Space farther apart than small red varieties. Radish "Black Spanish" HEIRLOOM 30 Seeds. Culinary hints - cooking and eating Radish. Very easy to grow. Sow between other vegetables as they will mark the rows until the slower germinating plants appear. Radish French Breakfast 100 Seeds Minimum Vegetable Garden Plant. Top Quality. 13-15cm top, crisp white flesh. Small slender taproot, distinct mildly pungent flavour. Top quality. Radish French Breakfast 100 Seeds. Culinary hints - cooking and eating Radish. Very easy to grow. ORGANIC Radish "French Breakfast" 100 Seeds Minimum Vegetable Garden Plant. 13-15cm top, crisp white flesh. Small slender taproot, distinct mildly pungent flavour. Top quality. ORGANIC Radish "French Breakfast" 100 Seeds. Culinary hints - cooking and eating Radish. Very easy to grow. Radish Watermelon 30 Seeds Minimum Vegetable Garden Plant. Rare & Unusual. Large white rooted radish with green shoulders. The inside flesh is red to pink and is very sweet and crisp. Pick these babies while they are colourful and still small. Culinary hints - cooking and eating Radish. Bulk Radish Watermelon 120 Seeds Minimum Vegetable Garden Plant. See my other lots of seeds. The flesh is white, firm, juicy and delicious. See my other lots of seeds. Surprise the original color, high technological qualities and will compete with any prestige class. Roots purple color, smooth, rounded shape with a thin tail, weighing 15-20 g, long tablet. See my other lots of seeds. Mid-season variety. Painting the skin red. The flesh is white, crisp and juicy. Used for fresh consumption and long winter storage. See my other lots of seeds. The variety is resistant to arrow appearance. See my other lots of seeds. Mid-season variety. The flesh is light green, juicy, slightly spicy taste. One of the most original varieties of daikon. The fruits are greenish-white outside and red inside. The flesh is juicy, taste great peninsula. Widely used as a choleretic agent. Stimulates the digestive system. See my other lots of seeds. High yielding, mid-ripening variety for the long winter storage. The flesh is white, crisp, juicy, slightly spicy taste. A group of varieties of radish. Weight is from 500 g or more (up to 1 kg). Use for salads, sandwiches, and hash. See my other lots of seeds. See my other lots of seeds. The middle-grade. The flesh is firm, white, tender, very juicy, excellent taste. See my other lots of seeds. New middle-grade. Painting the skin black. The flesh is white, firm, juicy and good flavor. Used for fresh consumption and long winter storage. See my other lots of seeds. Early maturing variety. Flesh is matte-white in color, dense, crisp and tender taste. The plant is not prone to premature formation of seed sprouts. Roots different colors: intense red, yellow, white, pink and dark purple. Having grown up on the garden this festive mix will enhance your culinary dishes an impressive variety. The mixture can be grown in the open field and under the film shelters. See my other lots of seeds. Early maturing variety. The root crop is elongated cylindrical shape with blunt tip, white, weighing of 20-25g. The flesh is white, very dense, juicy, tender and tasty. This variety of radish will delight gardeners with quality of product, decent taste. Radishes are round, with smooth sides, purple. The weight of each radish from 0.5-0.7 oz (15 to 20 grams). See my other lots of seeds. The root is cone, red, weighing of 120-150 g. Flesh is white, very juicy and tender.